Rescue Swimmer - RO is a course that focuses on the needs of Surface Water Inland Rescues per NFPA 1006 standards which addresses the skill levels not in a Swift Water Flood Rescue Course. 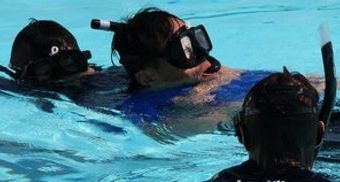 This course is designed to teach basic fundamentals of open water rescues safely, various swimming techniques, specialized equipment, victim management with a strong emphasis on the psychological and physiological aspects when conducting victim rescues. 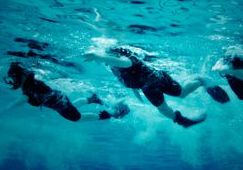 In this course individuals MUST pass a 300 meter swim test using any stroke in 8 minutes. AUDIENCE: This course was designed to support Water Rescue Operations and for those individuals who have static water ways with little to no water movement. It is for medium to strong swimmers but gives public service agencies the ability to respond to victims who are not involved in moving or swift water and who need a course to meet certain job, regulatory, or other requirements. This course is not a for rescue in water that moves greater than 1 knot (3 mph), see our Swift Water Rescue courses. COURSE FORMAT: This is a classroom and field practical-based which includes instructor, PowerPoint lecture, skills interaction throughout the course using yours or your departments equipment. this course is approximately 16 hours (two days) in length. 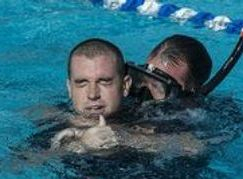 CERTIFICATION: Upon completion of this course, students receive a Rescue Swimmer course completion certificate and completion card that is valid for 2 years. It is recommended that students attend a refresher course every 2 years to remain current on new practices and technology.